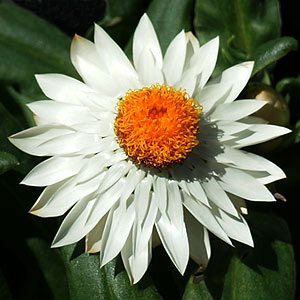 Bracteantha bractea is commonly called the Australian Paper Daisy or Strawflower. Bracteantha bractea are one of the easiest Australian Native plants to grow. An upright perennial plant with fine foliage and trademark golden yellow flowers. The flowers are large and a cheerful addition to the garden. Also used widely in the cut flower industry as well as used by florists. Long lasting flowers, heat and drought tolerant, great as a cut flower where they hold their colour well. Although the species is yellow flowering many cultivars have been developed, so white orange, red and purple flowers are also available. Grow in a sunny position in a well drained well mulched soil. Reaches 30cm 50cm high, 30 – 60cm spread depending on variety. COLOURWISE NURSERY (NSW) Pty Ltd Flowering shrubs, ground covers, structural plants and succulents.